Wingspread, built in 1939, was designed by Frank Lloyd Wright as the home for H. F. Johnson, the president of S. C. Johnson & Son, Inc. and his family. 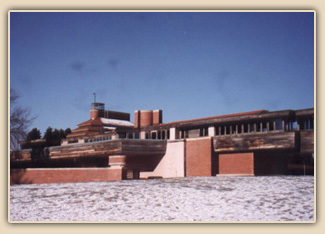 The 14,000 square foot building was Wright’s largest single-family residence and the last of his Prairie -style houses. The exterior view (right) shows the north wing, mezzanine balcony and the centrally located Great Hall. Today, Wingspread serves as an international educational conference facility. Over a two year period, Welsh Color & Conservation, Inc. investigated the original interior plaster wall, ceiling and wood trim finishes from 17 rooms. Using stereomicroscopy, polarized light microscopy (PLM) and FTIR, the original colors, pigments and vehicle composition were identified. The PLM and FTIR analyses revealed that the rough-finish plaster on the walls and ceilings was painted with a very unusual beeswax paint and the wood was finished with carnauba wax. For Wingspread’s interior, Wright selected a palette of only four colors: moderate orange yellow, moderate red, grayish blue and light green. The moderate orange yellow was used on all walls and ceiling while the other three colors were used as accent finishes, applied as glazes, over the orange yellow on selected walls and ceilings. The wax paints flowed unevenly on the rough-finish plaster, producing slight color variations in the painted surface. The striations formed by the painter’s brush strokes are illustrated in the photomicrograph below. The clear wax finish on the built-in wood furniture at Wingspread enhanced the variations of tonality in the horizontal and vertical orientations of the wood grain, adding to the unique decorative effect that Wright created. Frank S. Welsh wrote a comprehensive 22-page article on the wax paints and finishes of Wingspread. 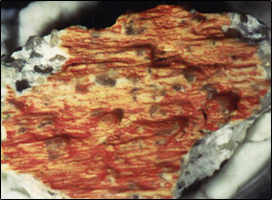 It was published in color in The Microscope, Volume 47 (1999). Complementary copies are available. Please call us or E-mail your request: fswelsh @ welshcolor.com. 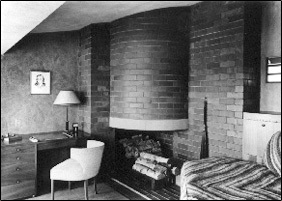 Original interior view of the Mezzanine’s Sitting Room. The wall above the desk shows the mottled appearance and brushwork of the original moderate red beeswax paint in contrast to the orange yellow ceiling This stereomicroscopical view illustrates the striations formed when the individual bristles of the brush deposited the moderate red beeswax paint onto the orange yellow ground coat on the rough- finish plaster wall.